PLAY: Plays / Pauses the track. Press and hold SHIFT and then press this button to "stutter-play" the track from the last set Cue Point. SYNC: Press this button to automatically match the corresponding Deck's tempo and phase with the opposite Deck's (or the Master Deck’s if using a 4 decks Skin) tempo and phase. Hold SHIFT down and then press this button to set this deck as Master Deck (for 4 decks skins). PAD MODES: 10 different PAD Modes are offered (see Pads). PADS: Offer various operations, depending on the PADs Mode. See Pads. PADS PARAMETER: Offer different functions depending on the selected PADs Mode. See Pads. SCRATCH: Press this button to set the Jogwheel to Vinyl (Scratch) or CD (Bend) mode. In Vinyl mode, use the outer part of the Jogwheel to bend (temporary speed up – slow down the tempo of the track). PITCH: Adjust the track's playback speed (tempo). The white LED next to the fader will light up when the unit’s fader is set at 0%. 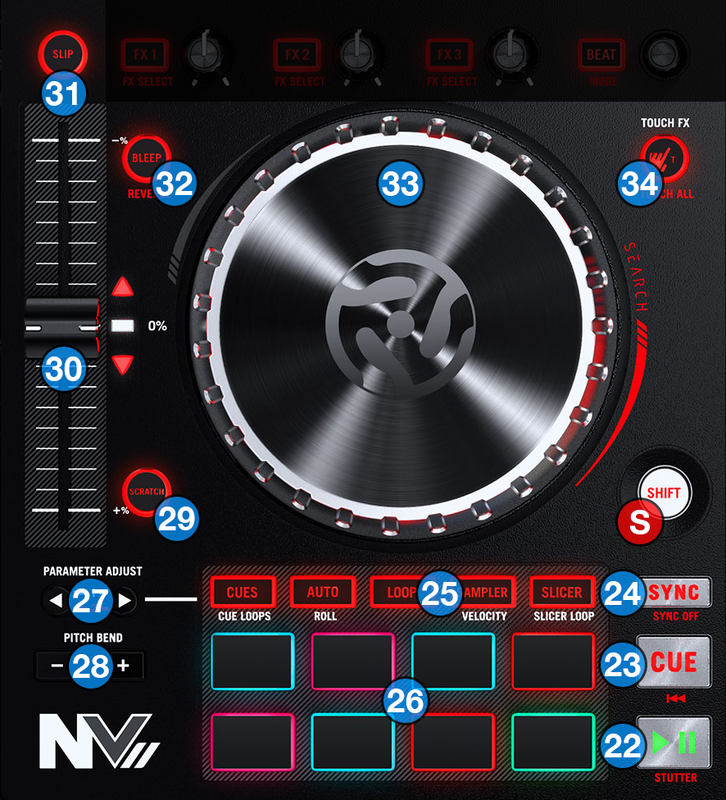 The Red Up and Down Arrow LEDs will lit if the pitch position of the unit and the actual pitch of the software do not match, to indicate the direction you need to move the hardware fader in order to catch the software one. SLIP MODE: Press this button to activate the Slip mode. Several software functions (such as Jogwheel movements, HotCues and Loops) will apply temporary on the track, and the track will return to the position it would have been when those functions are not triggered. REVERSE/BLEEP: While this button is held, the playback of the track will be reversed. When released the track will resume normal playback from where it would have been if you had never engaged the Bleep function (i.e., as if the track had been playing forward the whole time). JOG: Touch sensitive jogwheel. Use the jogwheel to scratch (if Vinyl mode is selected) or pitch bend. Hold SHIFT down and then use the Jogwheel to fast search through the track, but keep the phase synced. Press this button once to enable the FX TOUCH Mode. On this Mode the Touch Capacitors of the FX knobs trigger the Effects while touched. Press this button a second time to enable the EQ/FX TOUCH Mode. Led will blink to indicate this mode. On this Mode, the Touch Capacitors of the FX knobs (35) trigger the Effects while touched (same as FX TOUCH Mode), and additionally the EQ Touch Capacitors will kill the corresponding frequencies while touched. Press this button a third time to turn off FX TOUCH Mode. Press this button once to enable the FILTER ROLL Mode (LED lights on). On this mode, operating the filter knob (4) will also engage a variable length loop roll effrect. Press this button a second time to enable the FILTER FX Mode (LED Flashes). On this mode, operating the filter knob (4) will also trigger the effect of the first Effect Slot. Press this button a third time to turn off FILTER FX Mode.